Much can be said about the Taj Mahal. Undoubtedly the symbol of India, it’s listed as a UNESCO heritage site and it’s also one of the Seven Wonders. Furthermore, it took 22 scrupulous years to complete with an army of over 22,000 workers! Shah Jahan built the Taj Mahal in memory of his beloved wife, Mumtaz Mahal, who passed away giving birth to their 14th child in 1631. Whilst on her deathbed, Shah Jahan promised Mumtaz that he would never remarry and also that he would construct a grand burial chamber in her memory. It’s said that Shah Jahan was so heartbroken over Mumtaz’s death that he ordered the court into mourning for two years. Her body is inside the monument, along with the body of Shah Jahan. The romantic story of the Taj Mahal has captured Indians and tourists alike, for hundreds of years. 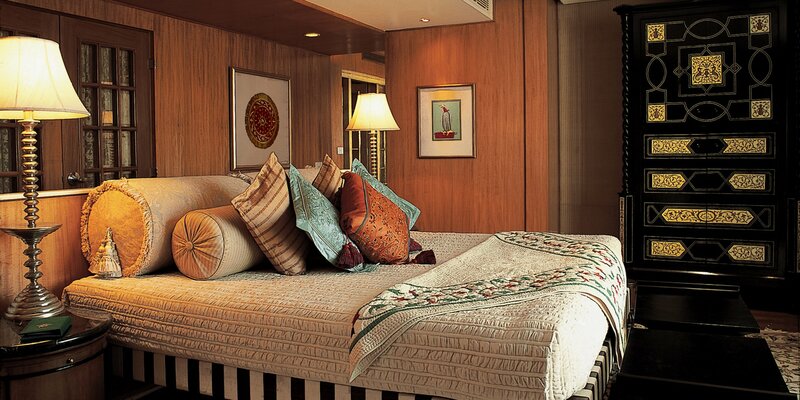 The Oberoi Amarvilas is undoubtedly the most luxurious way to experience the Taj Mahal in Agra. The Amarvilas is repeatedly ranked amongst the best hotels in the world, and it’s not hard to see why. Upon checking in to the Amarvilas, you’ll catch your first glimpse of the breath taking Taj Mahal from your very own room. Located only 600 metres (0.4 miles) from the Taj Mahal, each room boasts a private view of the great monument. It’s is the perfect place to observe the Taj Mahal in complete privacy and comfort, without the restriction of visiting hours. 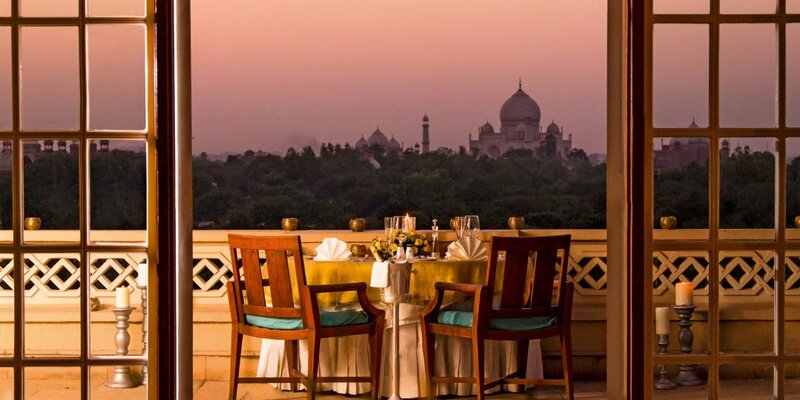 As the sun rises and sets over the Taj, its white marble glows with an warm orange hue – an impossibly romantic scene. The architecture at the Amarvilas was inspired by Moorish and Mughal styles, and is reminiscent of the Taj Mahal in its design and symmetry. The Oberoi Amarvilas is a fantastic display of royal Indian style, with terraced lawns, rippling fountains, reflection pools and rich pavilions. 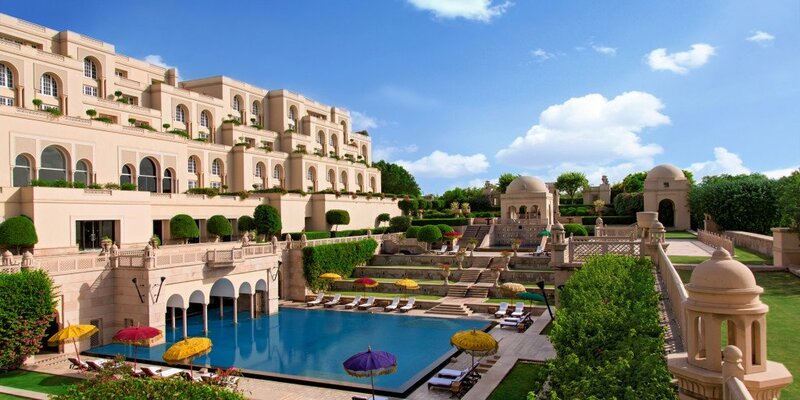 Along with private views of the Taj Mahal, the Oberoi Amarvilas also boasts one of the most luxurious spas in India. The spa too has views of the Taj Mahal, and claims to make its guests feel like royalty. During peak season (October – March), Premier Rooms at the Oberoi Amarvilas start from approximately ₹50000 per night, including breakfast and taxes. Get in touch with us for exclusive offers during summers; you may stay for a complimentary third night, enjoy complimentary select beverages between 6pm – 7pm, and much more.